On his way home after buying a new motorcycle a 21-year-old man was involved in an accident and it was discovered he was uninsured. Barry Madden, whose address was given as Clonmeen, Craigavon, was fined £200 last Wednesday at the local magistrates’ court for not having insurance on June 27 this year. For driving without due care and attention he was fined £75. 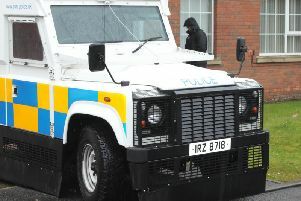 The court heard that at 5.30pm police received a report of an accident on the Northway in Portadown. When they arrived they saw a car parked on the edge of the nearside Lurgan bound lane. There was damage to the vehicle. Madden, who was on a Yamaha motorcycle, said his back wheel had locked as he was changing gear and he slid into the vehicle. He had no insurance and was a provisional licence holder. Mr Joe McDonald, representing the defendant, said while he had a terrible record it did not contain any motoring offences. He explained that Madden had insurance for his previous motorbike and he went to buy a new bike. Mr McDonald said his client was in between buying the motorbike and getting home when the accident happened.